Redamaks’ facilities are perfectly suited for private parties and special events. With our spacious main dining and North dining area, we can accommodate many sizes of groups for birthdays, anniversaries, family reunions, and wedding rehearsal dinners. 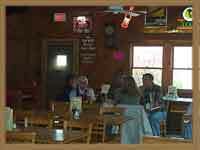 Parties of 12 or more can be booked, depending on the day, date, and time of day. We ask that the entire party be present to be seated. We will hold your event table(s) for up to 15 minutes. An 18% service charge will be added to your group’s check. No deposit is required to hold your table. Our Summer Season: June through late August. Weekends are extremely busy during these months. Holding tables during summer months is difficult; however, depending on the day of the week and time of your planned event, we may be able to accommodate your request. We carefully examine each request and work hard to accommodate each and every event! We understand that each group is different and special. We will do all we can to accommodate your group’s special needs. Enjoy dining in our heated & air conditioned four-season room! The majority of our menu can be packaged to serve large groups off-site. Now your group can enjoy our food and fun wherever you are! 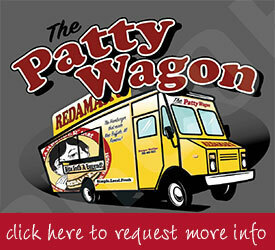 Redamak’s does not provide set-up of food service or breakdown at the completion of your off-site event. Redamak’s can also supply items to compliment your meal. For information, or to make a reservation, phone the Burger Hotline at (269) 469-4522 and ask to speak to General Manager Charles Maroney. Or, fill in the form below! Would you like to order from our menu? Have a custom menu created? If yes, do you want the appetizers listed on the special menu or do you want to pre-order a certain amount? Would you like the burger selections to come with Fries? Would you like to include a Children’s Menu? We do not offer desserts. Will you be providing your own dessert? If yes, what kind of dessert? Please note: we are a nut free (peanuts & tree nuts) establishment. Do you want beverages listed on the special menu? If yes, what beverages are included? Would you like to limit the amount of alcoholic beverages you’re paying for? Some hosts only pay for the 1st or 1st & 2nd round of alcoholic drinks. Do you need access to power and/or a projection screen to run your own audiovisual presentation using your own equipment? No Debit or No Credit Cards. ATM is located in the Building. Customer must call 1 week prior to confirm. Please ask for a manager.